We are also proud to announce the addition of Ginger Ramos as our newest agent and Property Manager of the Southern Coast! Ecuador Home Sales has been acquired by Gerald Brokate, a professional realtor with over 16 years of experience in the real estate industry. Licensed in the US and Ecuador, he believes in maintaining the integrity of the real estate profession and is committed always abide by the Real Estate Code of Ethics. Be sure to always work with a trusted realtor when thinking about one of the largest purchases of your life. We are committed to helping you find your dream home! Your dream home might be a condominium overlooking the Pacific Ocean or a completely furnished house right on the beach or a beautiful stretch of undeveloped land... whatever your vision of your perfect home Ecuador Home Sales can make that vision a reality. Ecuador Home Sales specializes in finding great value houses, condominiums, beachfront property, business opportunities and development projects. Properties are specifically chosen for features that are most commonly requested by people moving to, or investing in Ecuador. 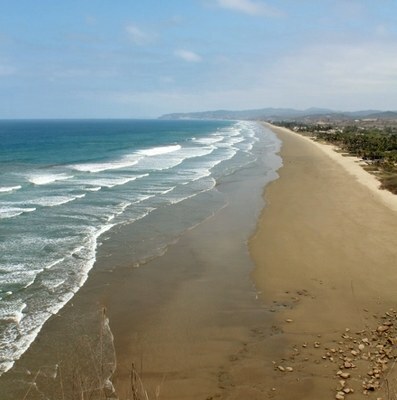 Areas include Salinas, Ballenita, San Jose, Olon, Manglaralto, Manta, Ayagnue - just to name a few. We find Properties and real estate that have wonderful views, desirable locations, quality construction, fixers, security, and of course, great value and the potential for appreciation. We make sure the homes and properties will have clear titles; working with attorneys and other professionals to ensure your investment. In addition to being an excellent place to live, we believe that Ecuador real estate is an exceptional investment - especially from Salinas up the coast to Puerto Lopez. There are some wonderful beachfront properties for sale, at prices that you just can't find anywhere else in South America. Real estate prices have appreciated steadily over the last few years, and this trend is expected to continue. Go Ahead...You Can Do It!! "I am very pleased to tell you about my property dealings with Gerald Brokate and relocating to Ecuador from England in recent months. I started communicating with Gerald over the Internet and made an initial visit almost exactly a year ago this month. Gerald was key to my decision to purchase the house I now live in in Chipipe. He first advised me on travel arrangements and picked me up at my hotel everyday during my 12 day stay to show me a wide range of properties in different locations around Santa Elena. I really believe that without this help I would not be in the location and in the house I bought. Trust is very important in any business relationship and I can honestly say that Gerald has proved himself trustworthy beyond doubt. I would highly recommend him to anyone looking to relocate to Ecuador." "My name is Christian Graff (Chef Ventura) and I am the owner and developer of Ocean View Hill and Rio Chico Beach Club. I was given Gerald's name from a very reliable friend and told that Gerald was one of the finest agents on the coast. I am pleased to say that a good referral is worth it's weight in Gold. Gerald has represented our development with professionalism and has exceeded all of my expectations. Since hiring him we have had an amazing year and have sales going into 2017. If you looking for your piece of paradise on the coast I highly recommend Gerald and while you're here please stop by Ocean View Hill and Rio Chico Beach Club and see what all the buzz is about." The Times Are Changing, Will You?? Ecuador is going to do the exact same thing Costa Rica and Belize did....get more and more expensive till most of you/us can't afford to own a "piece" of it! we hear people say "Someday I'll"...I remember growing up in California and said Someday I will live on or close to the beach and as years passed I realized that it was no longer in the cards for me. "Someday I'll do something"...well, we all know for most Someday Isle is that illusive location we continue to ONLY dream of. I have lived here for over 3 years now and I am still THRILLED with my decision to call this home. Come visit us and see why Ecuador is STILL the place to be. Ecuador Properties was created to help you find your place in paradise.We specialize in helping you in the search and purchase process. With over sixteen years of helping our clients we are very thankful for the opportunity to be of service to you. The experience we have gained over the last four years help us to make sure your purchase will go smoothly and be carried out by knowledgeable professionals. We want to provide you with not only beautiful places to live or vacation, but also make it fun while searching for that dream. Our team looks forward to being your personal agent and guide through the entire adventure. The real estate industry is in its infancy in Ecuador. At this time we are in our second year of the first multiple listing service in Ecuador. We find properties for sale by owner and do all the contacting, negotiating, and research for you to insure your peace of mind in this transaction. "Gerald was so accommodating! We met early in the day and spent the whole day looking at a wide variety of homes. Once we decided on a property, he helped make the whole purchase experience go quickly and stress free. His knowledge of the area and properties was invaluable. I would certainly refer him to anyone!" "My experience with Ecuador Properties was top notch. We corresponded by email before coming to Ecuador in May an Gerald provided with prompt and valuable information which was extremely useful in allowing me to make an informed decision on the house that I bought in Rio Chico. He also has stopped in a couple of times to check on how I was doing after I had arrived to take possession of my house. I would highly recommend Ecuador Properties to anyone who wants to buy property in Ecuador."